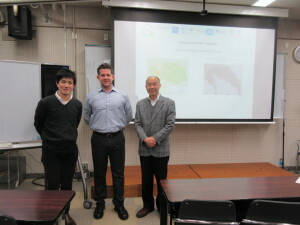 In February 2016 Michael Solem visited the University of Nara (hosted by Prof HIROSE Yuzo), the University of Nagoya (hosted by Prof KUNO Hiroyuki) and Joetsu University of Education (hosted by Prof SHIMURA Takashi, with Prof YAMAMOTO Ryuta also present) to initiate plans for an expansion of GeoCapabilities project collaborations in Japan. Discussions focused on new lesson study-based research exploring relationships between geographical knowledge, moral reasoning and ethics education. The National Center for Research in Geography Education will fund a workshop in Joetsu in October 2016 involving a delegation of Japanese teacher educators and teachers who will receive training to produce new vignettes of powerful disciplinary knowledge vis-à-vis the forthcoming GeoCapabilities teacher training platform, scheduled for public release in summer 2016.